Give your little princess a royal hide-away with this cite and adorable pet house. 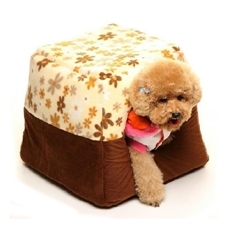 Pet house has a chocolate base and a solid yellow fabric with brown petite daisy prints. Yes, just fit for a princess! This royal pet house has a sturdy yet soft structural construction to keep your beloved canine companion (or kitty cat) cool in hot weather and safely protected and warm in the most bitter winter weather!